Chris Kent, a firefighter/EMT from Ohio and a dad of three, bought a bouquet of red roses for his wife after learning about her sad dream. One Sunday morning, Kent returned home after working a tiring 36-hour shift at the firehouse. Once home, his wife, who works as a nurse, told him about a dream she had. She dreamt Kent cheated on her. “She was visibly upset about the dream she had,” Kent wrote for Love What Matters. Later, when the family was preparing to go to church, Kent noticed his wife was still brooding over the dream. After attending church, Kent and his daughter went shopping. As they passed by a flower shop, Kent decided to do something to cheer up his wife and bought her some bright-red roses. 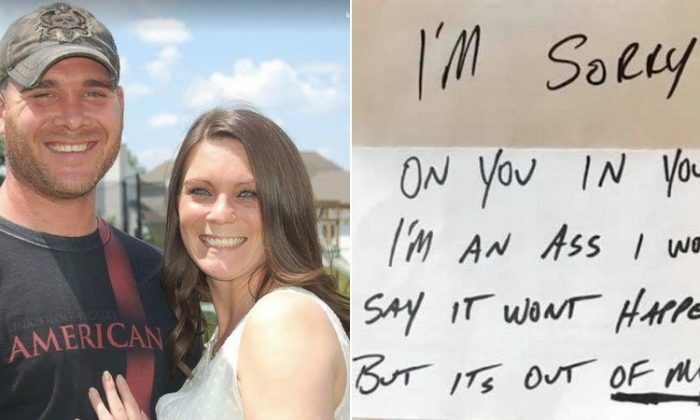 To lighten the situation, he penned a hilarious note that read, “I’m sorry I cheated on you in your dreams. Unquestionably, Kent’s wife would be all smiles receiving the flowers and the funny “apology” note. Kent shared this story to remind couples how important it is to show love to their significant other not just on Valentine’s Day or on their birthday. “I’ve always been the type to get flowers not only on those special occasions but also on a random Tuesday or whenever the mood struck me,” he added. Kent wants his wife to always feel loved and appreciated because that would set a perfect example for his kids. “When my sons see how I treat my wife I hope that when they grow older they will also treat their girlfriends and wives the same,” he shared. Kent says it’s not necessary to buy the most expensive gift as it is the love and thoughtful gesture that counts. “Appreciate the small things in life because at the end of the day it doesn’t matter what car you drive or how big your house is,” he concluded.